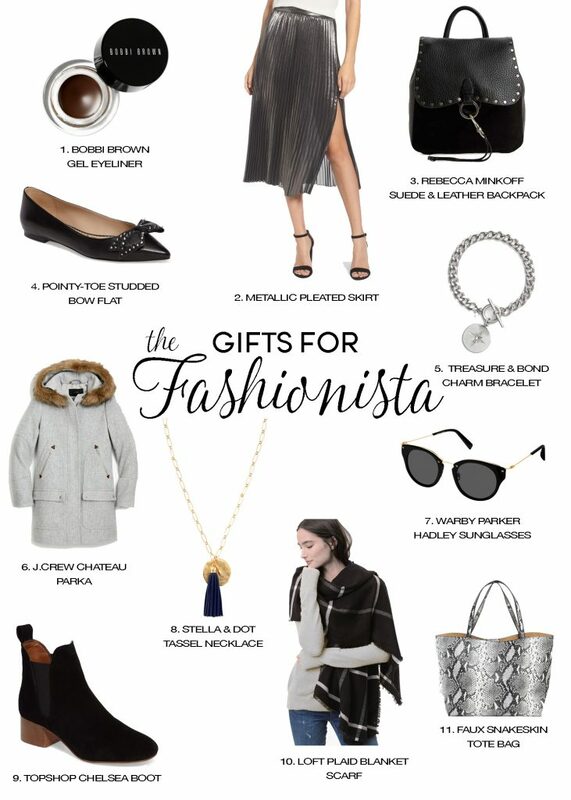 Maison de Cinq Holiday Gift Guide - Part Two - by Category! 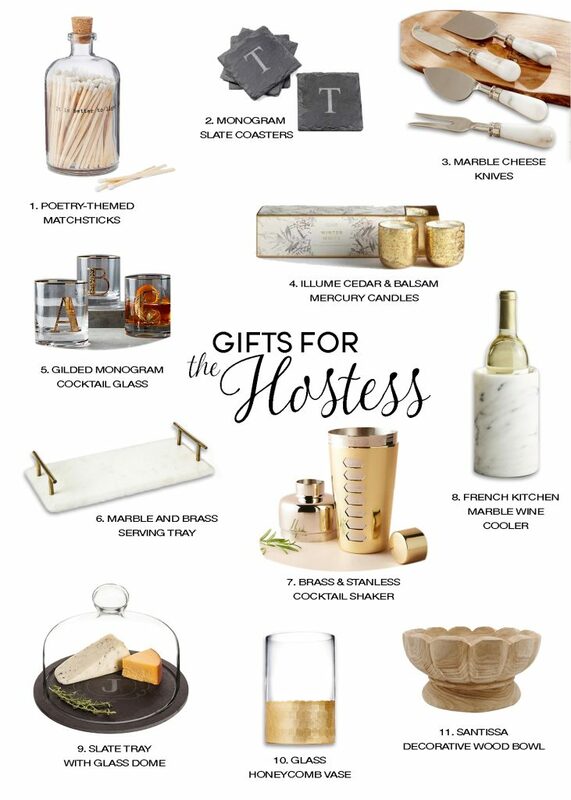 As promised, today I’m sharing Part Two of my Holiday Gift Guide! Hopefully you read Part One which I posted last Friday. As I mentioned in that post, my holiday gift guide is so extensive I decided to split it into two parts. Friday, I released the Men, Women, and Teens sections and today, I’m concentrating on personality types. 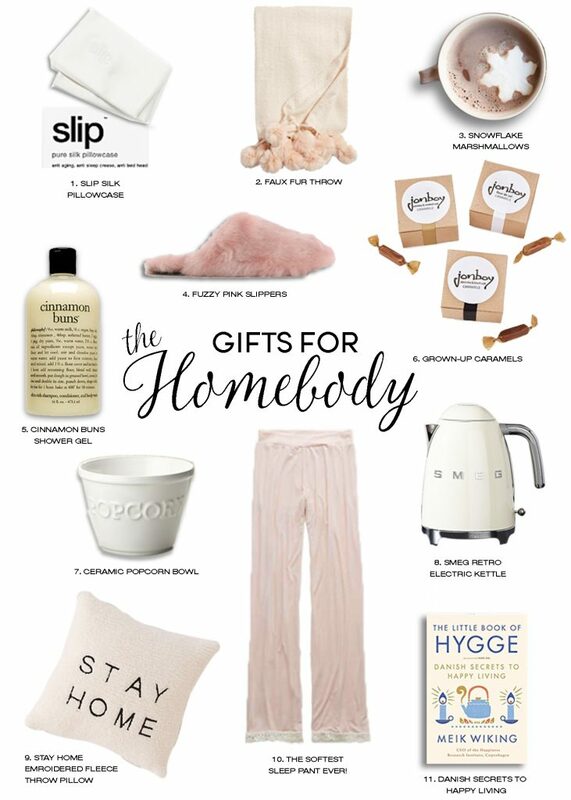 So whether you have a fashionista sister, homebody mother, or a foodie friend, I’ve got the right gift for you! These Slip silk pillowcases are so gentle, they allow your hairstyle or blow dry to last overnight! The coziest faux fur throw with adorable pompoms. Adorable (and yummy!) snowflake marshmallows are the perfect topping for a cup of cocoa. Banish cold kitchen floors with these cute fuzzy slippers. Philosophy Cinnamon Buns shower gel smells almost good enough to eat. Sophisticated, grown-up caramels. Another unique (and tasty!) item from one of my favorite online catalogs, Uncommon Goods. Whether you watch Game of Thrones or The Bachelor, this popcorn bowl makes it more enjoyable. Seriously the cutest kettle ever! Smeg is perfect for making tea on those cozy nights at home. “Stay Home” fleece throw pillow from Urban Outfitters. The absolute softest sleep pant ever! I challenge you to actually get dressed once you wear these! Are you familiar with the term “Hygge”? It’s Danish for cozy and comfortable well-being. You may be surprised how much you learn from this book. Monogram slate coasters are both casual and chic. These marble cheese knives might possibly be the perfect hostess gift! Illume Balsam & Cedar is one of the all-time best holiday scents! These gilded monogram glasses are one of my favorite gifts to give. So pretty! This serving tray is so popular at Target that it continually sells out. Get it while you can! This cocktail shaker makes a cool gift for the drink aficionado. French kitchen marble wine cooler. Such a great gift at a great price! Slate tray and glass dome is perfect for serving cheese or dessert. The Elsa vase from Nordstrom gives a lot of bang for the buck. A perfect bowl for serving salad or displaying flowers. Another one that sells out fast! A gift basket is always good, but one based on bacon?! Even better. The Chemex coffee maker is known to make the best coffee on the planet! Jacobsen makes amazing salts, and this collection gift set includes every flavor a cook could need. You can use this meat thermometer in the oven and it assures your meat cooks perfectly. The Kitchenaid Artisan stand mixer is a must-have kitchen appliance. It will change your life! These scissors cut through anything. The perfect stocking stuffer for the cook! This Cuisinart electric fondue set is so fun – and easy! Great for dinner parties with friends. I adore this copper pot ornament! 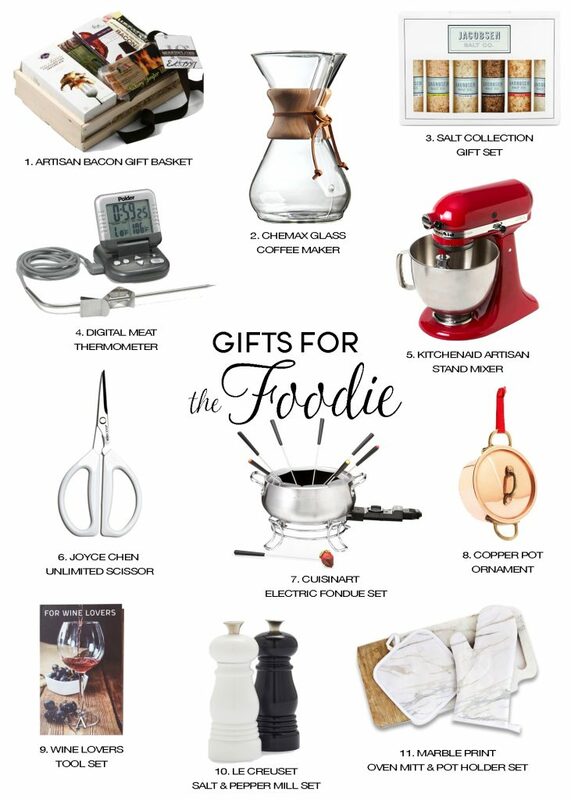 Another great stocking stuffer for your foodie loved ones. Cleverly packaged to resemble a book, this wine tool set is perfect for the wine enthusiast. This set of Le Creuset salt and pepper mills is both attractive and practical. Marble print oven mitt and pot holder are made from heat resistant fabric. This gel eyeliner is a life changer! Waterproof and sweat-proof. In other words, perfect! This metallic pleated skirt works for all your holiday parties, and beyond. Backpack style bag from Rebecca Minkoff has just the right amount of attitude. I love a pointy-toed flat, and this one is extra cute with the bow. Equal parts cute and edgy. Charm bracelet from Treasure & Bond. J.Crew makes the best coats, and this wool stadium cloth parka is no exception. Warby Parker Hadley sunglasses donates one pair to a needy person for every pair purchased. I’m loving this Carla tassel style necklace from Stella & Dot. A “Chelsea” style boot is the boot of the season, and this one from Top Shop does it perfectly. A classic black and white plaid blanket scarf from Loft. Super chic faux snakeskin tote bag – and the price is right! And if you missed Part One of the Gift Guide, you can find Men, Women and Teens HERE. Hopefully this has been helpful and inspired you in your gift giving this season! Wishing you all a wonderful holiday season… and Happy Shopping!